The 6,000-square-foot laboratory is a model facility with sophisticated equipment for mammalian cell and microbial culture, analysis of biological materials including DNA, RNA, and proteins, and confocal microscopy of biological tissues. Quinnipiac University students from the Frank H. Netter MD School of Medicine at Quinnipiac University Jason Bisaillon, far left, Najma Homidi and Alexander Buell in the new research lab on the North Haven Campus at Quinnipiac. Photo by Jennifer Lackie. 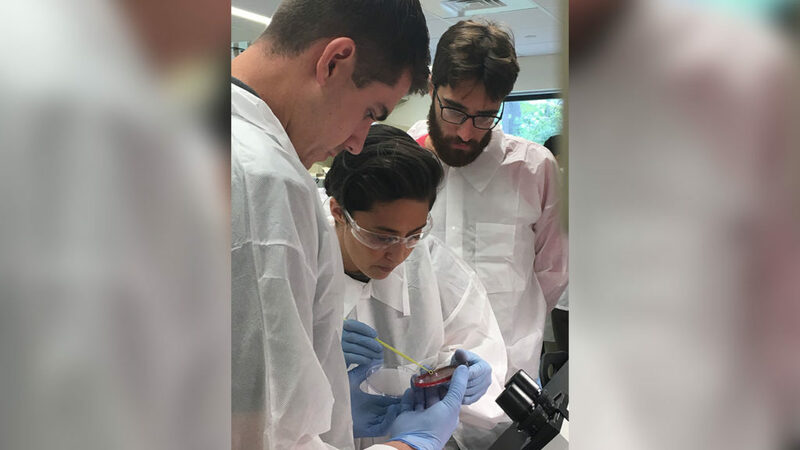 The Frank H. Netter MD School of Medicine at Quinnipiac University has opened a $2 million state-of-the-art, open-concept laboratory that will expand its research capabilities for faculty and students. Under the leadership of Laboratory Director, Shari Meyers, Ph.D., the lab was approved by Connecticut’s Department of Public Health and is fully certified. The 6,000-square-foot laboratory is a model facility with sophisticated equipment for mammalian cell and microbial culture, analysis of biological materials including DNA, RNA, and proteins, and confocal microscopy of biological tissues. In addition to pursing original research, faculty will use the laboratory to develop and deliver new curriculum experiences. The goal is to provide opportunities for the medical school faculty to pursue independent research projects and mentor students in biomedical research, according to Richard Zeff, Ph.D., professor and chair of medical sciences, associate dean for scholarship. The lab has a research proposal program in place and several initial projects have been approved. Projects are planned in the general areas of cell and molecular biology, physiology, immunology and neuroscience.